Sharp doesn't have a huge handset presence outside of Asia, but according to a spokesperson this week that's all about to change in a big way. 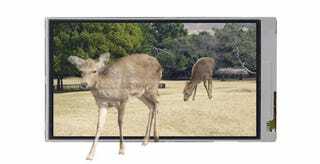 The company says they're putting their glasses-free 3D panels in a smartphone in 2010. If anyone's in a position to bring a 3D phone to market, it's Sharp; their parallax barrier displays are likely what puts the 3D in the Nintendo 3DS, they've already got the world's first 3D camera for phones, and they've already committed to using 3D displays in multiple form factors.